Today’s post might be a bit controversial, especially in the life coaching industry. But I’ve never shied away from sharing things people told me not to share before. Recently, one of my clients who is still in college was worried about finding a job in her field after graduation. Her mentors and fellow classmates had latched onto the idea that you should follow your passion. One person of great influence even told her class that they should NEVER apply for a job at a company that they’re not 100% passionate about. You will most likely never be 100% passionate about your career. 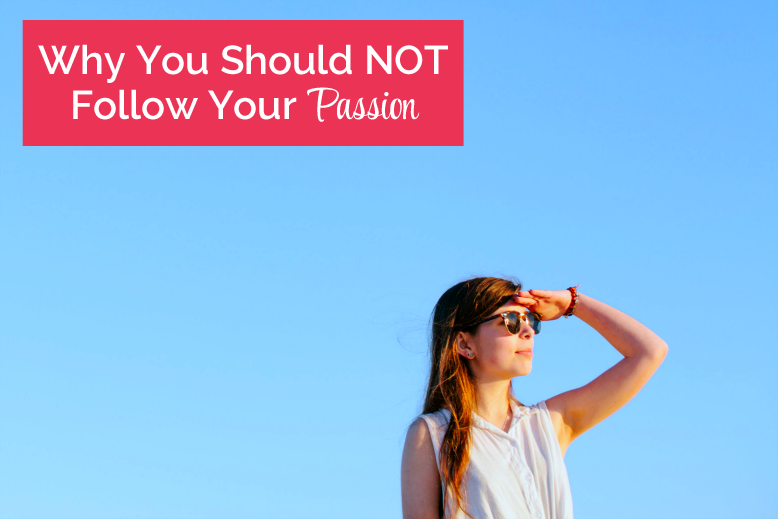 In fact, following your passion is a pretty awful way to choose a career. As uncool as this sounds, your career needs to take care of you in the real world, not in a fantasy land where everything is perfect. And that might mean following a path you’re only somewhat passionate about in order to have your other needs met. Well, that’s not entirely true. If I followed what I’m 100% passionate about—what makes my heart soar—I’d be dressed up like Minnie Mouse in Walt Disney World handing balloons to little kids. While dressing up like a cartoon mouse might make me happy, it won’t exactly pay the bills. And what about my husband’s job? I can’t ditch him and our puppy to follow my passion. So, I’m a life coach. I made my choice by finding my core belief that runs through all the jobs I’ve had in the past. Laura Simms of Create As Folk calls this your “through-line.” It’s the thread of your passion that ties everything together. And I might just be better qualified to do this job since I actually get to talk with people instead of hiding in a costume. What I’m trying to get at is that I don’t blame people for saying, “Follow your passion!” But a better idea is to find what interests you and go with that. Besides, you can’t expect your career to fulfill EVERY need in your life. That’s what romantic partners, hobbies, vacations, loved ones, etc. are for. Of course you love [fill in the blank: jewelry making, acting, skydiving]! But you know there’s more to life, right? We’ve all heard stories about people who focus on their “dream job” and who fall apart or feel like a failure if they don’t get it…or if they do and it’s not what they thought it would be. Seeing those people fail when they thought they were doing the right thing breaks my heart. When you follow your passion, make sure you don’t follow it off a cliff. How determined are you to have a career you’re 100% passionate about? If you follow your passion, will you neglect any of your personal needs? My challenge for you is to flip your mindset this week. Be open to the idea of having a job that’s good, but not one that makes you drool with passion. Do you think you could have a career that interests you, but you’re not 100% passionate about? In the comments below, share your passion and whether you want to pursue it as a career. This post focuses on Step 5 of the Life Editing Process, Make White Space for Personal Self-Care. For more about life editing and what it can do for you, click here. Sometimes people want a job that they can just go and do, earn some money, and come home to the things they’re passionate about. Sometimes, feeling passionate about every little thing you do can be exhausting. Sometimes, you just need to get real. Hey Sage, I’ve been stalking your blog all day after watching you on CreativeLive this weekend (Build a Successful Creative Blog with April Bowles-Olin). I agree, this seems to be quite a controversial topic, and I like your take on it. So many of us hear growing up that we can be anything we want to be… but then the reality of the real world sets in and we are forced to face that there are, in fact, limitations that are often out of our control. No, not everyone can be anything when they grow up. No, not all of us should follow our passion when choosing a career. I like to think that success lies when “passion” meets “talent” meets “need,” I’m not there yet, not even on the road yet, but the vision is getting clearer! Wow, this was so good for me to read! Life is not black and not white and now I´m trying to have the best of both worlds. Hi Herdis! Thanks for commenting. 🙂 Of course, I love my business too, but I’ve got so many other things to think about! And sometimes our true passions don’t translate well into a career. We have to take care of ourselves too. This may just be what I needed to read. I am hoping to at some point (crossing my fingers it is more sooner than later) to change jobs and maybe even careers, but I have been lost on what I should be trying to do with my life. I actually completely agree with you! I was always the “I’d rather make less money and be happy in my job than make tons of money but be miserable” girl. But now I’m kind of in the I don’t make enough and I’m kind of miserable boat so it didn’t really work out too well for me. I agree that the likelihood of being 100% happy in your job is super slim. Unfortunately it took me until the age of 30 to realize that I just need to focus on supporting myself with my job and indulge my passions in my “extracurricular activities.” I’m totally ok with that now and I’m working on making that my reality. Thanks, Sarah. I think there’s a middle ground here too. We can have passion for our careers, but we need to take care of our other needs too. Just like how a romantic partner can’t be everything we need, a job shouldn’t have to everything too. My hope is that people can find work they feel good about that also supports them financially. I just came back and re-read this post after some major things that happened this week 🙂 I feel like your timing is always amazing for me. I couldn’t have read this at a better time! Thank you again for sharing your wisdom with us. Reading this again has shown me a bit of light in an otherwise very dark week. Hi Sage! I’m so glad to be reading this. I had my spinning with thoughts this morning, and as much as I would love to just work on developing and believing my own business, Having another career would be helpful. Thanks for teaching us! You’re so welcome, Vanessa! We can be passionate about our work, but we can have passion for others things too. Our jobs don’t have to fulfill every need. I’m proud of you for how hard you’ve been working on your new business! After reading this post, it’s true — I’m someone who has multiple passions and can’t possibly turn all of them into a career. Some of them I enjoy — teaching — but can also bring frustration. On the flipside, I also love wine, travel, and running. I want to build a business around: teaching, but try to fuse some of my other passions into that as well. The hope is that this business provides me freedom and opportunity to follow some of my other passions. I think that is what will make an (almost) complete life! Thanks for sharing. I love what you’re saying, Sage. I’ll admit I read the title and disagreed but the true message is spot on. It’s so important to mitigate our ideal pastime with visions of a career that fits in with our overall design for life. That’s what I’m working on right now! Doing a lot of reading, soul searching, and research to determine the right career for a balance of passion, security, and potential. Thanks for the post! But we can have passion for things in life without having careers that solely focus on that passion. My life is so much bigger than my career, and I hope my readers will learn to be open to other career options.